FREETOWN, Sierra Leone (AP) — The president joined with families in paying final respects Thursday to victims of this week’s mudslides and flooding in Sierra Leone’s capital, while the government warned residents to evacuate a mountainside where a large crack opened. Approximately 350 people had been confirmed killed and 600 more remained missing from the disaster early Monday. Workers struggled in the thick mud and debris of smashed homes looking for more bodies, picking their way through stools, shoes and other remnants of daily life. 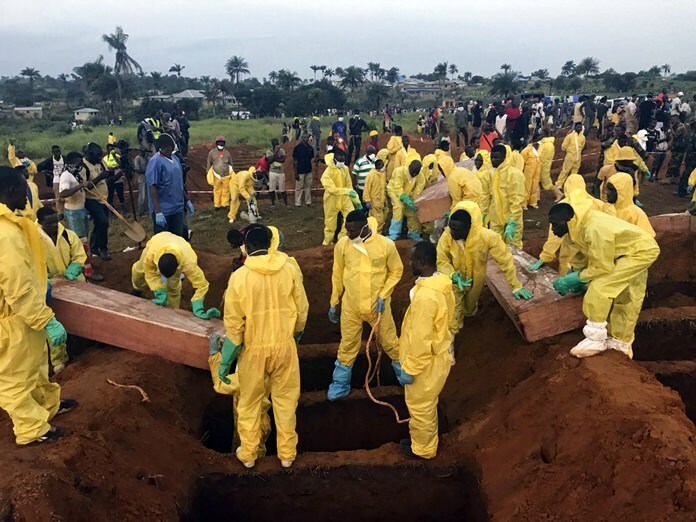 The government hired 600 gravediggers for individual burials taking place in a cemetery that already holds victims of the 2014-15 Ebola outbreak which killed thousands in the West African nation. “We all share the agony which has befallen the nation,” President Ernest Bai Koroma told mourners at the cemetery. “They had their hopes and aspirations, a bright future — like the six innocent children who went to study in the home of one of their brightest colleagues, like the young man who was due to get married tomorrow, like the husband who has worked so hard to get his family a new home and had just moved them to this new and lovely home,” he said. Dr. Owiss Koroma, the government’s chief pathologist, said the confirmed death toll from the mudslide and flooding was at least 350, a third of them children. The bodies of many victims were too mangled and decomposed to be identified. “I lost my sister and mother. The water took away my mother and sister and they have buried them today. That’s why we are here, to mourn and go back home,” said Zainab Kargbo, who was among those at the cemetery. Thousands lost their homes in poor, low-lying areas of Freetown and surrounding communities. With more rain forecast for the coming week, further mudslides were a threat. The Office of National Security warned people of the danger from the newly opened crack on the side of a mountain and urged residents to evacuate. The main focus is getting people away from areas still under threat, Zuliatu Cooper, the deputy minister of health and sanitation, told The Associated Press. The mudslides tore apart multistory concrete homes, leaving their metal reinforcements tangled like threads. Incongruously, on the same hillsides, near swaths stripped bare by the surging mud, fully intact homes still stand, with untouched, lush vegetation. Grieving survivors said they were haunted by thoughts of dead relatives. Sierra Leone has pleaded for international assistance, while Amnesty International issued a statement accusing the government of failing to learn from similar incidents. “Due to a lack of regulation and insufficient consideration for minimum standards and environmental laws, millions of Sierra Leoneans are living in dangerously vulnerable homes,” said Makmid Kamara, the group’s deputy director of global issues. Many poor areas around Freetown are near sea level and lack good drainage, which makes flooding worse during the rainy season. The capital also is plagued by unregulated construction in hilltop areas. Deforestation for firewood and charcoal is another leading contributor to flooding and mudslides. Associated Press writer Carley Petesch in Dakar, Senegal, contributed to this report.